India's most famous News Anchor. Consulting editor at the India Today group. Sardesai comes with 20 years of journalistic experience during which he's covered some of India's biggest political stories. A Padma Shree winner, he's also played cricket for Oxford. an Indian journalist and news presenter. Sardesai is the consulting editor at the India Today group. 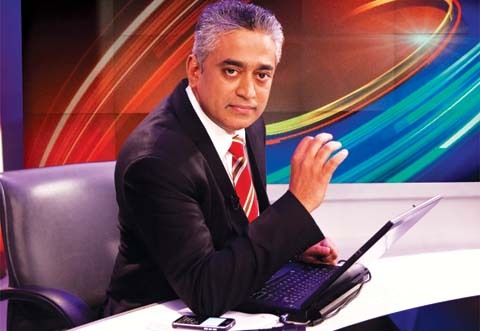 Rajdeep Sardesai has worked with The Times of India for six years and was the city editor of its Mumbai edition. He entered television journalism in 1994 as Political Editor of New Delhi Television (NDTV). He was the Managing Editor of both NDTV 24X7 and NDTV India and was responsible for overseeing the news policy for both the channels. He hosted popular show like 'The Big Fight' at NDTV. He later quit NDTV to start his own company, Global Broadcast News (GBN), in collaboration with the American giant CNN and Raghav Bahl's TV18. The latter broadcasts the Indian Edition of CNBC called CNBC-TV18, the Hindi consumer channel, CNBC Awaaz and an international channel, SAW. He has also been the President of the Editors Guild of India, the only television journalist to hold the post and was chosen a Global leader for tomorrow by the world economic forum in 2000. During the total career, he has covered major national and international stories, specialising in national politics. He has contributed to several books and writes a fortnightly column that appears in seven newspapers. The prestigious Padma Shri for journalism in 2008, the International Broadcasters Award for coverage of the 2002 Gujarat riots and the Ramnath Goenka Excellence in Journalism Award for 2007. Inducted into The Hall of Fame for Continuing Contribution to Industry (Professional) in ENBA Awards 2010. His current flagship show on CNN-IBN, India at 9, has been awarded the best news show at the Asian awards for the last two years.